The latest Google Maps beta update began rolling out to users late last night, and it brings with it a feature some users have been requesting for years: User-selectable language and voices. Not only that, but there are a few things from the teardown that may be of interest. Some of them are more like follow-ups to older topics, but there are some new bits of information to check out with each one. For many people around the world, it's common to set a phone's default language to something other than the local tongue. There are plenty of reasons for this, and it's generally not a problem in most scenarios, but it can make things in Google Maps a little confusing. You need only launch navigation mode and listen to the pronunciation of the road names and landmarks to understand why. Most of them sound downright absurd in the wrong language or dialect. Users have been complaining about this for years, often suggesting that they just need the ability to switch to another language for voice feedback during navigation. The latest update gives them just that. 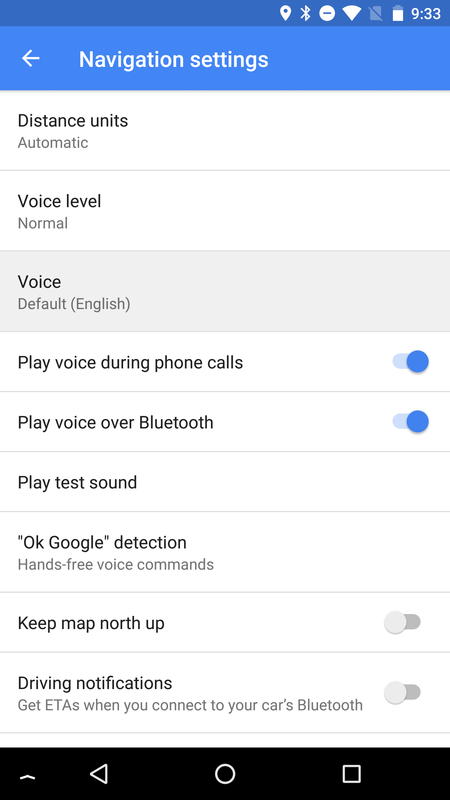 To find the setting, just open Settings -> Navigation Settings, and look for "Voice" near the top. 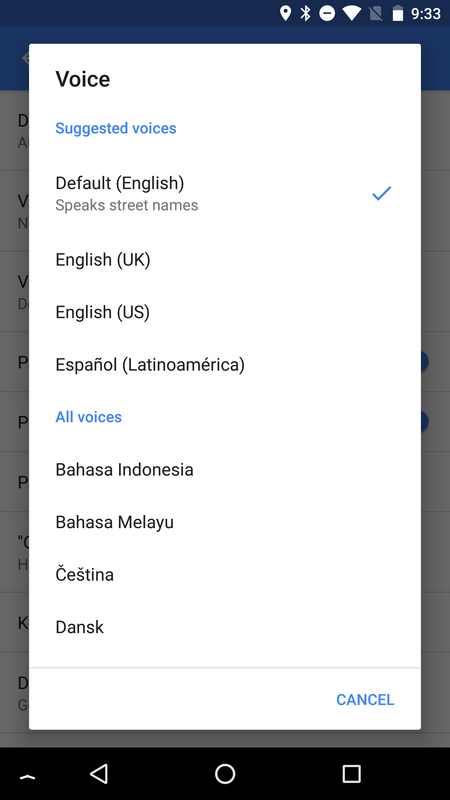 Tap on it and you'll see a list with recommended voices, based on your current system default (and maybe location) followed by a list of the languages Google Maps supports–about 44, right now. In truth, this is clearly more about supporting different languages than having a selection of voices; but there is at least an option between US and UK English, so voices are technically a part of this too. Switching to one of these voices will leave the visual interface in the same readable language you've been using, but now you'll hear voice feedback from navigation mode in the newly selected language. It was here, but it's gone again. The "remember monthly driving stats" toggle that came in v9.59 has been removed in the new release. There's no sign of why, but I haven't seen any record of my monthly driving stats in my email or the app, so it may simply not have been ready yet. The meaning of "two-wheeler" isn't hard to discern, but I can't say that it's a common phrase where I live. Unless I'm missing something, this seems to obviously refer to motorcycles, motorbikes, mopeds, and other light vehicles designed to ride on just two wheels. Maybe the Maps team is choosing to say "two-wheeler" because it covers the many geographically different terms and physically different types of vehicles that share the same common base. Regardless, there is a two-wheeler mode coming to Google Maps. The first signs of the new mode appeared in v9.60, but looked more like the setup for survey questions. With the latest update, there is now a line that explicitly says "two-wheeler mode." There aren't any clues yet about changes that may be intended for people on motorcycles (and similar machines). I don't personally ride, so I'm not too well versed in the ways that Google Maps could be changed to offer a better experience, but I wouldn't doubt there are many ways to augment navigation mode for the better. There are probably more than a few readers that could make suggestions of their own in the comments. Reserve with Google was announced back in July, promising quick and easy bookings from Google search results and from within Maps. While I can't say for sure that it never arrived in Maps, I've tried a lot of different spas, salons, and gyms in major cities, but I can't find one that can be booked inside of the Maps app, even though the same places can be booked from Google search. Judging by the some recent additions, Reserve with Google is finally on its way to the Maps app. There are quite a few new lines that include the name of the program and sales pitches focused on looking better, getting fit, and more. There's not too much to point out from the strings that isn't already covered or fairly obvious from the original announcement, but there are a couple of things I'll briefly call out. The first is that Maps seems to list a few specific categories for services that you can search for and book: Barre, Dancing, Facial & Skincare, Haircut, Massage, Pilates, Waxing & Threading, and Yoga. It seems Maps will also make it easy to see your reservations, or at least link back to the places where you might want to make one. The Reserve with Google screens will include a menu item to add a homescreen shortcut that can be used to return directly to a screen to set up bookings. The shortcut will be named "Reserve" and display the icon above.